Brilliant release featuring exclusive new seasonal songs from five of Matinée’s most beloved current artists. Seattle’s Math and Physics Club arrive with sleighbells on, as ‘It Must Be Christmas’ successfully manages to knit candy canes, carolers, mistletoe, reindeer, Santa’s sleigh, snowflakes, stockings, and winter into an indie Christmas carol of their very own. Copenhagen’s Northern Portrait answer the challenge with an acutely jangling take on Christmas tradition called ‘Leave The Trees Alone’ which speeds along at a distinctly steady pace. Tis the season to be jolly, indeed! Glasgow duo Strawberry Whiplash celebrate the season with a reverb-drenched and highly melodic nod to our overworked chubby pal up north called ‘Santa Needs A Holiday,’ while new label signing Champagne Riot from Copenhagen set the bar high with their debut Matinée track, the orchestral and hypnotic holiday love song ‘Xmas Safari’. Finally, Glasgow’s prolific Bubblegum Lemonade deliver a Jesus and Mary Chain-infused tale of the telly going out on Christmas day called ‘White Noise Christmas.’ This is not your standard Christmas fare and we’re all the better for it! 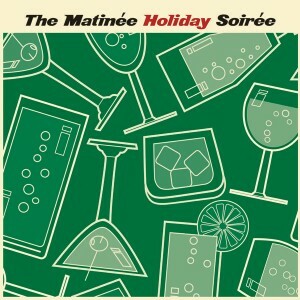 Five festive songs from Matinée’s finest, the ‘Matinée Holiday Soirée’ is a sparkling celebration of the season that will be an essential holiday staple for years to come. Limited to 1000 copies in custom minijacket sleeve.